PUBLISHER’S DESCRIPTION: Based on the Los Angeles Times newspaper series that won two Pulitzer Prizes, this astonishing story puts a human face on the ongoing debate about immigration reform in the United States. Now a beloved classic, this page-turner about the power of family is a popular text in classrooms and a touchstone for communities across the country to engage in meaningful discussions about this essential American subject. Enrique’s Journey recounts the unforgettable quest of a Honduran boy looking for his mother, eleven years after she is forced to leave her starving family to find work in the United States. Braving unimaginable peril, often clinging to the sides and tops of freight trains, Enrique travels through hostile worlds full of thugs, bandits, and corrupt cops. But he pushes forward, relying on his wit, courage, hope, and the kindness of strangers. As Enrique launches his eighth attempt to reach the United States by means of train hopping, the risks are clearer than ever to him: death, dismemberment, robbery, extortion, and sexual victimization. But the way he sees it, staying in Honduras presents its own bleak and terrifying future. Gangs and violence are rampant, poverty is entrenched, and opportunities for work and self-betterment are virtually nonexistent. Worst of all, Enrique’s mother, Lourdes, has been absent from his life for an achingly long time. A single mother with no dependable means of support, she left for the United States when Enrique was five, entrusting her two children into the care of relatives. Enrique’s sister has weathered the eleven-year separation reasonably well, but it takes a heavy toll on the young boy. During his teen years in Honduras, he spirals down into serious drug use and antisocial behavior. As his life grows ever more troubled, Enrique imagines that reuniting with his mother will repair the hole in his heart. In this vivid and comprehensive account, Sonia Nazario retraces Enrique’s eighth attempt, following his 1,800-mile route through the heart of Mexico, an odyssey lasting 47 days. She expands the picture to cover conditions facing others on a similar migratory path. The chapters are embedded with fascinating micro stories of places and people who assist, deter, or exploit the thousands of Central Americans flowing northward through Mexico on train roofs and other modes of transportation. The narrative captures the flavor of distinct geographic zones. The most notorious stretch is Chiapas, in extreme southern Mexico. Chiapas is dense with gangs, bandits, immigration patrols, and unsympathetic residents who look down on the migrants as the “stinking undocumented.” In this region, migrants are easy targets of crime, since as a rule, they’re too fearful to report it, and in many cases, the police collude with the criminals. At one point, gang members chase Enrique along the top of a moving train. After they catch and beat him, he jumps off the train and sustains a serious injury. Migrants like Enrique also encounter good-hearted people, who are typically quite poor themselves. Some of them make it a regular practice to toss food and water to migrants clinging to the roofs of passing trains. Some even open their homes to strangers with nowhere to shelter between train departures. There are agencies and churches that offer assistance, including a few that give the severely injured a place to heal. These accounts of compassion touched me to the core. I was also moved by the camaraderie that develops among train riders, who often sacrificially share with strangers whatever small comfort they can—blankets, food, water. Although they pool resources, exchange information, and organize lookout duty so others can sleep, individual migrants often find themselves in terrifying circumstances beyond the reach of kind, but equally vulnerable, strangers. When Enrique arrives at the border with Texas, he’s finally able to call his mother, yet his ordeal is far from over. After many complications and long delays, Enrique makes a perilous crossing. There is no fairy-tale reunion. His anger over the heartbreaking separation spills out in words and self-destructive actions. Gradually, things get better as Enrique matures, finds work, and begins to seek legal status. For kids who like dystopian stories, here’s a true-to-life dystopia to check against those from fantasy. This book is not light reading, nor is it meant to be. Most young readers will endure the gritty parts if only to find out what happens to Enrique, who, like teens everywhere, holds a mix of dreams and demons. Some readers may have a hard time getting past the controversies that swirl around undocumented immigrants, but the slant of this book is not toward proposing policy or resolving debates. 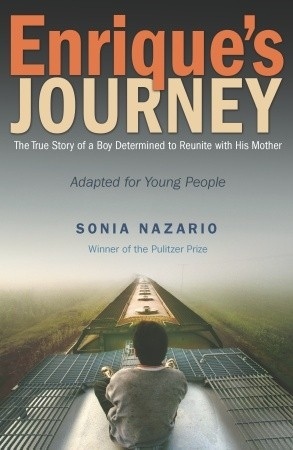 By concentrating on the story of one boy from a broken society—a boy whose resilience and courage seem at times superhuman in the face of nearly insurmountable odds—Sonia Nazario brings deep human dimension to a thorny issue of our times. ADDITIONAL RESOURCES: In the official website for Enrique’s Journey, under the tab Educator Resources, teachers can locate extensive lesson plans and activities across the disciplines, along with a list of recommended movies and documentaries. The publisher has also released a Spanish edition, La Travesía de Enrique, and the site includes lessons geared toward students of Spanish. Sonia Nazario has been a frequent guest on television and radio shows, including On Point, with Tom Ashbrook. Her views were featured in an op-ed piece in the New York Times. Enrique’s Journey is being used as a text across America. This report focuses on the book’s impact in college classrooms. Which Way Home is one of the movies on the publisher’s recommended list. Here is a radio piece about it. In 2014 the number of unaccompanied children and youth attempting to cross our southern border reached crisis proportions, demonstrating the need to understand what drives Enrique and thousands more like him to make the journey. 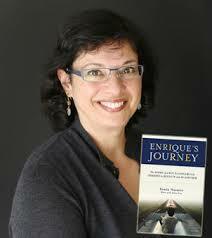 SONIA NAZARIO is an award-winning journalist with more than 20 years in the industry. Enrique’s Journey is her first book-length project. Her official bio can be read here. Thanks, Lila, for introducing us to the creative non-fiction YA of ENRIQUE’S JOURNEY. It’s nice to be introduced to another author with an heritage from Argentina. I often listen to the song “Volverte a Ver” by Chenoa who also was in Argentina. I share your suggestion that real life stories like this should be of interest to American teens. My only regret is that many so called Latino novels and non-fiction for teens (and adults) focus on the negatives of living in South and Lain America. In ENRIGUE’S JOURNEY the readers are introduced to unsympathetic people in Chiapas. My YA fiction is about Selena from Chiapas and presents the beauty of Chiapas and its people. I communicated with an American woman working in a Mission in Chiapas and she was very positive about the people of Chiapas. This lead to a bigger topic about the identity of Latino Teens in the United States. Do we harm their self-image by presenting them with too many books which are negative about their countries of heritage? I see that our public library system has 13 copies of the book by Sonia Nazario so I’m going to read it. Best wishes to all. Hi, Giora. Thanks for commenting. After you read Enrique’s Journey, I believe you’ll share my confidence in Sonia Nazario’s objective reporting about what has occurred in Chiapas. As for the negative focus, although many good people must reside there, the author’s investigation turned up strong anti-immigrant sentiment. Other regions of the world with heavy immigrant traffic have experienced similar problems. I hope you’ll check out more of our reviews. We’ve found quite a few Latin@ novels for kids and YA that paint complex pictures of life in Latino communities and in Latin America.